Low Cost Green Car / LCGC owned Datsun, Go, actually already has a design that is easily given a touch. Just look at the modified Datsun Go sporty and had exhibited at the event Gaikindo Indonesia International Auto Show (GIIAS), last week, at booth Datsun. 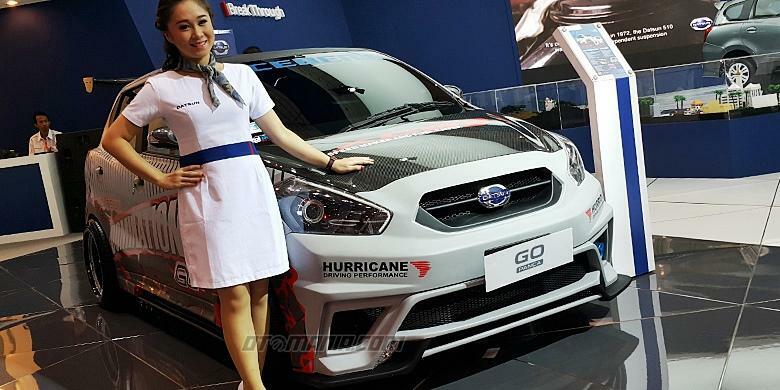 Go standard face is formed to be more sporty with a capital of custom body kit. Additional supporting accessories such as headlights mounted custom, as well as some touches of carbon on the hood, rear view mirror, to the rear wing. While the original body wrapped in silver gray sticker. Go with this sporty changes made shorter than the standard version. Per custom Grandmax mounted front and rear are trimmed, while for aftermarket rims measuring 17 inches by 8 and 9 inches wide. Sporty impression entrance to the interior. Although themed extreme but the original form of the interior Datsun Go is still clearly visible. Custom game on the dashboard with carbon motifs rely on the main theme, which collaborated with the Bride and accessories Sparco seats which thicken the scent of his racing style. Offsetting the zoom, the machinery sector are also not spared from change. Energy booster system from Hurricane through the water filter and stabilizing electricity XCS3 become a mainstay collaborated with several brands of other performance products. As a means of entertainment, its owner chose to use a single-DIN headunit Nakamichi. Besides already pocketed modern feature is also not damaging the original dashboard. SQL a reference entertaiment theme that transforms standard audio system using an aftermarket product. Buddy Products of Dominations mainstay. Starting from the speakers fullranfe, midbass, power, until the subwoofer. Changes in the entertainment sector is indeed takes up space on the rear trunk, but for a spare tire can still function normally.